Thanks to AK Audio for the review sample. I have the black version with mic. You can choose it without the mic and there’s a rose gold option too. If you are familiar with YinYoo and NiceHCK, you will know what to expect by their packaging. Here we find a cardboard box, which contains a carrying hard case, which in turn contains the earphones and the eartips. Very simple, but functional. The cable is not removable, and it has some controls on the wire (one button, which can play/pause and skip tracks with different actions). The button has a good click and it works perfectly. There’s a nice working microphone too. The problem is: I really don’t know which earphone is the right one, because they are both marked as left. With a simple test, I understood the right one is the one with the wire controls. Apart from that, I love the design, the materials and the build quality of these earphones. 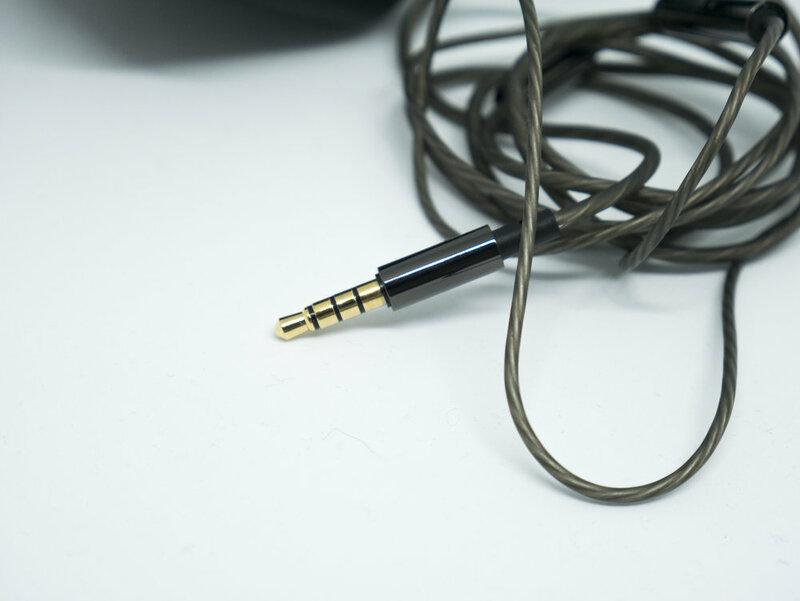 They are made of metal and ceramic, and the cable reminds me of the Meze 11/12 series. There’s a mesh filter, which I believe it’s made of tissue. On the connector and on the Y split there are some reinforcements, so I’m 100% satisfied with the build quality and I’m not worried about the resistance of these buds. The fit is average, for my ears which aren’t easy to match with classic in ears. With some foam tips they are more stable. It’s a bit better than the fit I had with the Meze 12 Classics, which I really cannot wear without them falling. I don’t think these earphones have been successful. I didn’t read any reviews (because I didn’t search, but even on social networks nobody seems to have shared his review). So, I guess it’s something that sounds unusual and doesn’t encounter people’s taste. After trying these earphones, I’m not sure if this is true. I liked them. They are cheap and they are meant to be considered a first buy, or just an upgrade from your phone’s stock earphones. But even by choosing these consciously, for me they would be very nice sounding. They are, actually. They can be considered V-shaped. It’s nice to have this signature in a consumer-oriented pair of earphones. They can suit a lot of genres and answer to the needs of everyone. Sure, I’d prefer a flat signature if I could choose, but I’m perfectly fine with this one. Especially because the driver (a single dynamic) has a really good quality and the tuning is good. I tried the V2 by YinYoo before, and they still are one of my overall favorite earphones. It seems that these ones could be good too, in a different way. I don’t generally like non-detachable-cable earphones, neither classic in ears (I’d rather have an IEM style); but the general quality make me appreciate these Y1 as a whole. The first thing I liked is the soundstage: I generally like a wide, extended perceived stage; the Y1 are not crazy wide, but they don’t feel congested and the imaging is pretty precise, so you have a sense of immersion which is enjoyable and far from the bad holographic try of the KZ ES4, for example. The sub-bass is smoothly reached and give a nice background to these earphones; the mid-bass is luckily controlled and it doesn’t fall on the midrange, which I’m surprised of, because cheap earphones tend to have issues on that area. Mids are a bit recessed, but lively enough. The instrument separation in that area is better than average, and there’s a good layering. The best thing of the whole play is the sense of space, which feels true. Vocals are relaxed, not sharp at all (which I like), even on tracks which are often critical with some sets. Treble is very nice, with nearly no sibilance nor harshness. There could have been the classic pick on the upper midrange to give a touch of color and clarity and widen the stage; there isn’t, but I don’t miss it, though. It could have ruined this relaxed tuning, which at the same time doesn’t miss any energy. I’d like to compare some models differently from the other times. Considering this is barely “moddable” (not having a removable cable), I will put them face to face with other similar earphones in their concept. BGVP Sidy DM3: really capable, but immature. Y1 are better, even though DM3 (which are pretty old I think) were trying to surprise with vocals and space. The tuning was really bad, though, because they wanted to enlighten certain aspects, by sacrificing others – maybe more important. So, the tuning is very strange on DM3, but you can like them as you like, for example, the Simgot Meeture MT3: for vocals. Y1 are an overall better choice, because they are tuned in a more mainstream way. Meze 12 Classics: they are better in an absolute way, but considering the price range I’d go 100% on the YinYoo. Same qualities on the outside, different ones on the inside. I don’t love the darkness of the 12 Classics, neither their congestion. Y1 are closer to my taste. ADVANCED M4: considering these are among my all-time favorites, it would be hard to make them lose. They are pretty different in their sound signature, much flatter than the YinYoo. I won’t say the Y1 lose here, though: they are cheaper and they are absolutely worth the money. I prefer the M4 because they are more suitable for my needs (music production, ecc..). Even though they don’t make the best impression with that poor quality control (both buds are signed as left), the YinYoo Y1 look gorgeous and they are perfectly crafted with premium materials. I like the sound too, for me it is solid and mature enough to suit the needs of the majority of people. The stage is impressive, not for width but for precision and imaging and they really provide a pleasant overall sound that I couldn’t but recommend.